Running out of space on an iPhone or iPad is frustrating. You can’t take new photos, some things don’t work, and iOS nags you about “managing” your storage. Thanks, Apple—we know our devices are nearly full, but clearing space isn’t necessarily easy! What can you do? You have two options: delete apps and cull data from within apps. Before we start down those paths, let’s figure out where to focus. Navigate to Settings > General > Storage & iCloud Usage. In the Storage section, tap Manage Storage. You see a screen that shows how much space you’ve used and how much is available, along with a list of apps and how much space they and their data occupy. Tap any app to see more details about how much space it occupies, and, if it’s not a built-in Apple app, an option to delete it. If there are apps in this list that you never use, delete them. Start at the top of the list and work your way down. Remember, you can always re-download apps from the App Store app. For Apple apps that can’t be deleted, and other apps you don’t want to delete, this list is useful for identifying where you can trim data quickly. The most likely culprits are video, audio, and photo apps, including Apple’s TV, Music, Podcasts, and Photos. Messages may also appear here, thanks to photos and videos in your conversations. If you aren’t using iCloud Photo Library, photos go in your Camera Roll album and can build up there. Sync them to Photos on your Mac via iTunes, and then delete them from the iOS device. You can sync an album of favorites back if you have space. 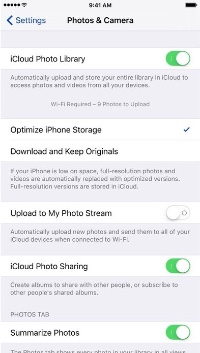 If you have subscribed to iCloud Photo Library, make sure to turn on Optimize iPhone/iPad Storage in Settings > Photos & Camera. That stores small thumbnails instead of full-sized images. If you’re low on space, Photos automatically uploads full-resolution originals to iCloud and then replaces them with smaller thumbnails on your device. Even thumbnails take up space, though, and there’s no way to reduce that space further. In Messages, you have two choices. You can either delete a conversation wholesale (it’ll remain on your Mac) by swiping left on it in the message list, or you can navigate into a conversation, tap the i button, and scroll down to the list of images and attachments. Tap and hold briefly on an image or attachment to bring up buttons for Copy, Delete, and More. Tap Delete to remove just that file, or tap More to select multiple items (tap each one to give it a blue checkmark) and then tap the trash icon in the lower-right to delete them all. Some apps may download a lot of media as you watch or listen but not delete it later or give you an interface for doing so. In such a case, your only option is to delete and reinstall the app, which recovers space but may result in the loss of some settings. As a final note, when you’re ready to replace this iPhone or iPad, come on in to MacExperience and consider getting one with more storage! Between photos, videos, music, and downloads, it’s easy to fill up your Mac’s drive, particularly if it has fast but small flash storage. A MacBook Air might have only 128 GB of drive space, and that goes quickly. Numerous utilities exist to help you find and delete unnecessary files, like GrandPerspective, OmniDiskSweeper, and WhatSize, but in macOS 10.12 Sierra, Apple provides a built-in tool to clean house: the Storage Management window. Storage Management is hidden inside the System Information app and is most easily accessed by choosing  > About This Mac, clicking the Storage button, and then clicking Manage…but wait! Before you click Manage, look at the About This Mac window’s Storage view. Hover over each colored bar to see how much space is taken up by a particular type of data. The white space at the end of the bar is what’s still available. You can’t do much here, but the view gives you a quick overview of your drive usage. When you click Manage, System Information launches, and the Storage Management window appears. (You can also open System Information manually and choose Window > Storage Management.) In the sidebar at the left, ignore Recommendations and look at the rest of the categories. They will vary a bit between Macs, depending on what apps you use, but they correspond to the colored bars you saw in the About This Mac window’s Storage view. For app-specific categories, like GarageBand, Mail, and Photos, Storage Management merely tells you how much space the app’s data occupies and provides a button for opening the app. For those apps, you must delete unnecessary data from within the app itself. More interesting are the Applications, Documents, and iOS Files categories, all of which may contain gigabytes of unnecessary data. iOS Files, for instance, shows any device backups and software updates that are stored on your Mac’s drive. It’s worth keeping the latest backup of devices you still use, but many people have older backups and unnecessary updates kicking around. The Applications category shown above lists your apps and is sorted by size by default. But try clicking the column header for Kind and scrolling down. You can probably delete any apps tagged as duplicates or older versions. Similarly, click the Last Accessed column header to see which apps you haven’t launched in years. Many of them can probably go too. Plus, you can re-download anything tagged as coming from the App Store, so you can toss those apps if you want. In Documents, you’ll see three buttons: Large Files, Downloads, and File Browser. Large Files focuses on files over 50 MB in size, Downloads shows you the contents of your Downloads folder (much of which you probably don’t need to keep), and File Browser gives you a column view that’s sorted by file size and shows sizes next to each item. It’s great for trawling through your drive to find see what’s consuming all that space. In any of these views other than File Browser, hover over any item and you see an X button for deleting the file and a magnifying glass button that reveals the file in the Finder. To delete multiple files at once, just Command-click or Shift-click to select them and then press the Delete key to remove them all at once. Storage Management gives you the combined size of all the selected files and warns you before deleting the files, so you can use this technique to preview how much space a multi-file deletion will save. In File Browser, select one or more files and either drag them to the Trash icon in the Dock, or press Command-Delete. If your Mac’s drive has is filling up—if it has less than 10 percent free space—consider using the Storage Management window’s tools to search out and delete files that are just wasting space.